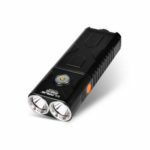 The TK35UE 2018 is a rechargeable high-performance flashlight. 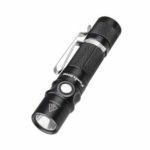 Fitted with CREE XHP70 LED, it delivers a max output of 3200 lumens and a far-reaching distance of 300 meters. The innovative toggle switch freely and rapidly switch between tactical, outdoor and lockout modes. 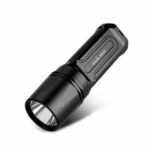 Powered by two 18650 batteries, the battery holder features Micro USB charging function. 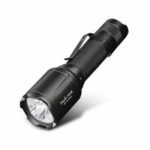 It has five output levels, plus momentary on strobe and SOS modes, battery level indication is fitted as well. The parallel battery compartment design, flat body and unique dual tail switches, making TK35 UE 2018 very suitable for military policing, outdoor exploring, camping, searching and caving. 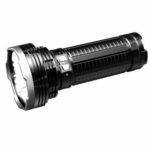 Fitted with CREE XHP70 LED, it delivers a max output of 3200 lumens and a far-reaching distance of 300 meters. Offering 5 brightness levels (turbo/high/mid/low/eco), plus Strobe and SOS. Powered by two 18650 batteries (not included), the battery holder features Micro USB charging function. 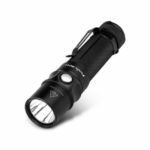 Instant strobe response rapidly in emergency situations. Battery level indication and low-voltage warning. Reverse polarity protection to protect from improper battery insertion.